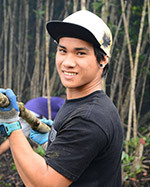 The Lunalilo Scholarship Project has touched many lives. Listen to some of our scholars as they tell their stories. Read essays on individuals and families whose lives have been transformed by The Lunalilo Scholarship Project. Can An Educational Scholarship Truly Transform A Life? Jennifer Wong-Ala is studying global environmental sciences at the University of Hawaii at Manoa. Just two years ago, Jennifer worked a minimum wage job and faced vanishing dreams of going to college. Jennifer aspired to become a doctor and studied hard to earn a spot on Kailua High School’s honor roll, but had no financial means to pursue her dream. Her high school counselor encouraged her to enroll in Kapi`olani Community College with the help of a King William Charles Lunalilo Scholarship. Supported by a unique team of counselors, teachers, and financial aid advisors, Jennifer completed her first year at KCC, and knew she needed more. 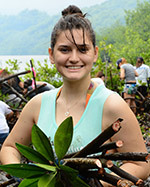 She continued at UH, with amazing opportunities that led her to Costa Rica, Los Angeles and Washington, D.C. to present research on marine bacterium and stream ecology. 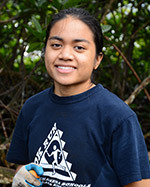 She is a friendly face at KCC ready to help other students in the Lunalilo Scholarship Project as a Peer Mentor. Well on her way to a new career path, Jennifer’s journey is far from over, but her new life has begun. My parents and grandparents never received a college education because they simply could not afford it. Their American dreams were to go directly in to the workforce and start making money so that they could one day help put me through college to pursue my dream. As a senior biology major I have my dream career in sight, and the Lunalilo Scholarship Project is helping me make that dream a reality. Without the scholarships I would not be where I am today. I never would have had the opportunity to meet all of my great friends, or the faculty and staff who are genuinely thrilled to help and watch me grow and progress as an individual. Going to college has been one of the greatest things I have ever been able to do so far for myself in life, and it wouldn't have been possible without the help and support of my family, The Kaneta Foundation, and the Lunalilo Scholarhip Project. Thanks to The Kaneta Foundation and Lunalilo Scholarship Project, I have the ability to focus on my education without worrying about finances. I know that someone is invested in me continuing my dreams. I am grateful for my scholarship because I would not be at the University of Hawaii without it. I love the relationships I have built, the experiences I have gained, and the opportunities I have been given here.